Martin Buber was professor of the history of religions and Jewish religion & ethics from 1923 to 1933 at the University of Frankfurt. He resigned in 1933, after Hitler came to power, and immigrated to Israel where he taught at the Hebrew University in Jerusalem. Buber wrote numerous books during his lifetime (1878-1965) and is best known for I and Thou and Good and Evil. His philosophy of dialogue-that is, the 'I-Thou' relationship which affirms each individual as being of unique value-is extremely well-known and has influenced important Protestant theologians like Karl Barth, Emil Brunner, Paul Tillich, and Reinhold Niebuhr. There is truly no genuine understanding of contemporary Jewish and Christian theology without reference to Martin Buber. 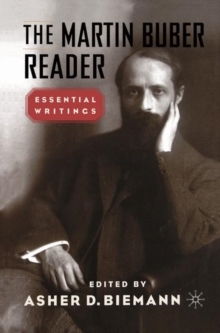 His appeal is vast - not only is he renowned for his translations of the Old Testament but also for his interpretation of Hasidism, his role in Zionism, and his writings in both psychotherapy and political philosophy. Pages: 303 pages, V, 303 p.